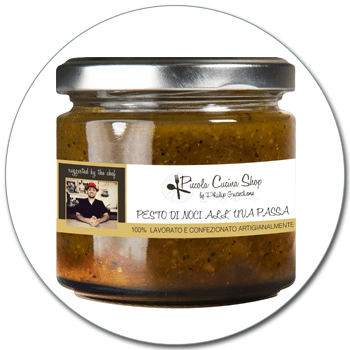 We reinterpreted and recomposed the traditional sicilian Pesto di Noci (Walnut pesto). Raisins soaked in sweet Wine (Malvasia) and freshly dried Basil leaves add a velvety yet fresh note to the traditional nut sauce. Add Walnut Pesto to the cooked and drained pasta. Sauté for 2-3 minutes in a large frying pan. Sprinkle with cheese and serve. Try Walnut pesto mixed with cream and served with ricotta-filled Ravioli. A 170g jar serves 4-6.